If you want the F-150 Power Stroke's full 30 mpg, you'll need to make do with two-wheel drive. It's been over a decade in the making. 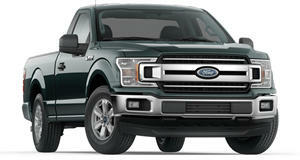 Ford has given its best-selling F-150 a compression-ignition heart for the first time in history. Yet when the Blue Oval first , powered by a new 3.0-liter turbodiesel V6, it left out one very important measure: fuel economy. Now, after over three months of waiting, Ford has finally announced the Power Stroke will achieve an estimated 30 mpg highway... but there's a catch, and it will cost you a massive 5 mpg. The 2018 Ford F-150 Power Stroke has been given an EPA-estimated fuel economy rating of 30 mpg highway, 22 mpg city, and 25 mpg combined. Ford boasts the 30 mpg highway figure is best-in-class, outperforming the 's 27 mpg highway figure. However, David Tracy at did a bit of digging and found the F-150 Power Stroke will only achieve that figure in two-wheel drive spec. Checking off 4x4 on the option sheet drags down the highway mileage figure a massive 5 mpg. “A Ford representative told me ... the four-wheel drive version of this same truck scores an EPA rating of 25 MPG highway, 22 MPG combined and 20 MPG city,” wrote Tracy. The discrepancy, he found, had to do with a combination of factors. The 4x4 system adds extra driveline drag and increased overall vehicle weight. The two-wheel-drive model is also fitted with a taller 3.31 final drive ratio and all-season tires on 20-inch wheels, while 4x4 models run a shorter 3.55 final drive, sit on all-terrain tires with grippier treads and receive a “Torque on Demand” transfer case. These differences, along with possible aerodynamic changes, conspire to drag down highway fuel economy figures by 5 mpg in 4x4 models. The F-150 Power Stroke's 3.0-liter turbodiesel V6 is mated to a 10-speed automatic transmission and will begin arriving at dealers this May.